Merry Christmas! Here’s hoping that your day is full of whatever weather you wish for, or at least whatever weather you can bear! This evening at dinner we discussed when we learned that Santa Claus wasn’t real (or, more precisely, that the real Santa died in the 4th century AD). It came up because this is the first Christmas that a particular cousin of mine no longer believes in Santa Claus. I’m told she was devastated when she finally figured it out. Hopefully this will cause no more strum und drang than is usual for a teenager. 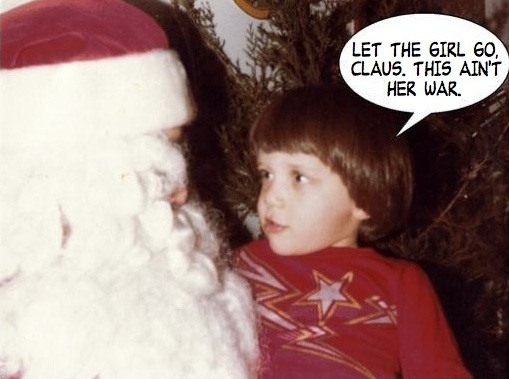 I deduced there was no Santa Claus when my older sister, who already knew The Truth, told me that Santa was real. As best as I can recall, her inflection suggested that she was lying to me. I remained calm, knowing that there’d be gifts under the tree for me regardless (this was before adopting my anti-gifting policy). It hasn’t really snown (that’s right, snown) here since 1989, at least not as far as I can remember. There’s been a little bit here and there, but never enough to stick on the ground. Anyhow, snow and ice had formed on my folks’ car door handles, and my friends and I went around lifting the handles to make the ice pop up in the air. It turned out that may have broken all the handles on my mom’s station wagon; it’s also entirely possible that they broke on their own at precisely the same time by coincidence or divine action. I concede nothing. One Christmas, I would like to wake up and look outside and see a carpet of snow here in Florida. Not a dusting that’d melt a few hours after impact, not so much that you have to hike your knees up to trudge through it. Just a couple of inches, enough to last a couple of days. Enough to scare the drivers around here off the roads, and the milk and bread off grocery store shelves. Just enough to dampen city sounds and to crunch underfoot, to blanket the grass and the pavement and bushes and tree branches and roofs, to scrape together a few decent snowballs, to leave meaningful footprints and snow angels and hearts with lovers’ initials. Maybe next year. I’ve always heard that he died in the 7th Century AD. Snow would really do it in for Florida and really create a great atmosphere. though I imagine if it had snown the hysteria would be greater than you anticipate. I never believed in Santa, all of the stories and movies have him coming down the chimney to deliver the presents but the house I grew up in didn’t have a chimney. So I could never figure out how he would come in to give me the coal/presents. Yesterday’s snow flurries got alot of people excited.